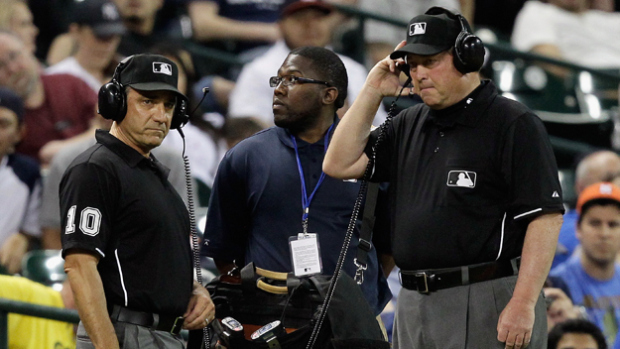 With the advent of Instant Replay and Slow-Motion Camera technology, Major League Baseball is at a turning point. Fans, umpires, and front offices have unprecedented access to information regarding what’s happening on the field, and with that information come some very pointed questions. It doesn’t do much good to have every camera angle if the rules aren’t clearly defined. What follows is a list of things that I think the MLB needs to define clearly within the rules in the future in order for Instant Replay to work the way it is intended. Without these clarifications, the rules will remain shrouded under a cloud of mystery to the average fan, causing much frustration. Statistics for this are courtesy of the excellent Baseball Savant. The fielder’s hand only gets the loose part of the uniform, and not the body (AKA the playground debate). You get the idea. It’d be preferable if MLB could clear this up before it becomes a rather silly debate/awkward conversation in the replay room. 2) When does a First Baseman have possession? This comes up at least once a week for every team; the play at first has made up nearly 35% of all challenge plays this year. On a bang-bang play at first base, there are often moments when it seems that the runner hits the bag at the same time that the ball hits the glove. I’ve heard it said colloquially that the out is recorded when the ball hits the back of the glove, but this does seem a bit ambiguous. For instance, if an outfielder has a ball hit the back of his glove, but then the ball pops out when he’s rolling on the ground, it’s not a catch. I’ve always thought that, sort of like in the NFL, some sort of baseball move has to happen for possession to be established. If we establish a clear precedent in writing, perhaps that for first basemen only “Ball Hits Web” is equal to possession, then replays would be more clear and would take less time. In this play, the runner is originally ruled safe on the original slide, and ruled out on the overslide. Upon review, the runner was called out on the original slide. The question at play here is “Is this one play with two calls, or is this one play?” The rules give examples of a catch call leading to a tag play as two separate plays, but two calls on the same play at the bag are not mentioned. Having more examples here would clear this up. 4) What is an appropriate running lane? Rule 7.08 (b)-1 says that the appropriate running lane is 3 feet on either side of the path, but this isn’t enforced thoroughly. This could easily be done; make all the basepaths easily defined on the paths, or have a Pitch F/X type system that superimposes the running lane onto the replay screen. Without this, there will always be arguments about the width of the basepath. 5) What exactly is a swing? The rules are woefully inadequate here. The rules hint at such terms as “strikes at the ball” but this is literally up to anyone’s interpretation. Everybody has their own interpretation; wrists breaking, bat crossing the plane, etc. We’re going to get eventually to the point where replay technology is fast enough to review swing calls, and there has to be a precise definition before this can happen. 6) What is and isn’t a balk? We’ve all seen days when a lefty pitcher gets called for three balks by Bob Davidson, and protesting that he’s been doing the same move the whole season. That pitcher has a point. The rules have regulations regarding balks, and they’re pretty clearly laid out, but they’re not enforced uniformly. After we get some consistency with enforcement, we can move this into a more fan-friendly understanding. There are a lot of other ambiguities that could be discussed here (Where is the Strike Zone? Is the Neighborhood Play allowed? etc.) but these are just some ideas for what MLB could clear up in order to save themselves some headaches. As we delve further down the replay rabbit hole, we need the rules to be clarified just as much as we need our viewpoint clarified. Good call to action. MLB has at least shown the ability to adjust on the fly when a rule interpretation is totally out of whack (https://aldland.wordpress.com/2014/04/15/baseball-notes-rule-interpretation-unintentionally-shifts-power-to-outfielders/), but it definitely seems more entrenched with respect to these longer-standing grey areas you’ve identified. I agree that instant replay technology is likely to force the issue.